Made using artisanal methods, our crafted collection of vinegars include varieties such as wine, sherry and flavor infused raspberry and truffle. Starting centuries ago and still true today, all great vinegars begin as a select concentration of grape musts. Made using artisanal methods, our crafted collection of vinegars include varieties such as wine, sherry and flavor infused raspberry and truffle. Traditionally produced in northern Italy, Balsamic Vinegar of Modena has become a respected culinary addition whose process is protected by Italian law. 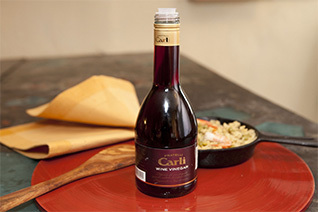 While balsamic tends to be sweet, savory and almost creamy in its highest concentration, wine vinegars are usually lighter; each one matches a unique usage that has been cultivated and perfected for many years.